Submitted photo Kuppuswamy Arumugam, an assistant professor of chemistry at Wright State, leads a research project aimed at developing more effective cancer therapeutics. FAIRBORN — A team of Wright State University chemistry researchers is working on a novel approach to fighting cancer thanks to a three-year, $470,000 award from the National Institutes of Health. Kuppuswamy Arumugam, an assistant chemistry professor in the Wright State College of Science and Mathematics, and Jonathan F. Arambula from The University of Texas at Austin, are leading the effort, which includes postdoctoral, graduate and undergraduate researchers. “There are some new results and we’re very excited about it,” said Arumugam. The R15 award from NIH is designed in part to help expose undergraduates to research. It aims to involve students in research a way that is intellectually stimulating, experience-driven and significant to the research. Students will be involved in participation in the design of experiments, collection and analysis of data, presentations at meetings and drafting journal articles. The research project by Arumugam’s team is aimed at developing more effective cancer therapeutics using a combination of synthetic chemistry and biological high throughput screening. Arumugam, who teaches organic chemistry, said his team is making new chemical compounds with the goal of using them as anti-cancer drugs. Arumugam and his team are focusing their efforts on “dual targeting” compounds, which contain both gold and redox-active organic moieties to exclusively amplify specific amounts of reactive oxygen species and protein inhibition within cancer cells to trigger programmed cell death. “Combining them together is making an effective hybrid drug,” said Arumugam. The compounds would also include a mechanism that selectively targets cancer cells. The sum total of these features is proposed to give a more effective cancer therapeutic drug. Currently, chemotherapy is widely used to kill or control cancer cells. But it can also have damaging effects on healthy cells. Researchers have been investigating the use of gold and other metal derivatives as a way to target cancer cells, spare healthy ones and possibly even induce an anti-cancer immune response from the body. The next step for Arumugam and his team is to test the compound on mice and come up with a way to improve its water solubility so that the next generation compounds can be delivered effectively. That would effectively make it a new drug that would have to be re-studied. But that process would be accelerated because the protocols used to study the original compound are already in place. The team also needs to determine if a receptor needs to be attached to the compound in order to target it to specific cancer cells. 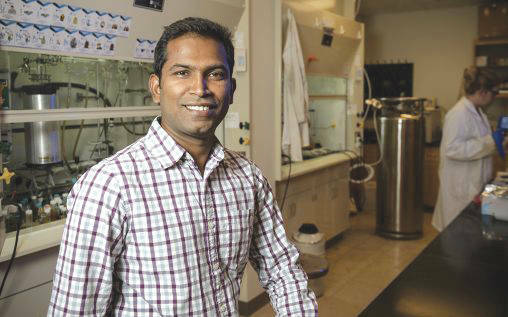 Arumugam earned his Ph.D. in chemistry from Tulane University followed by a postdoctoral stint at The University of Texas at Austin. He worked as an assistant professor at St. Bonaventure University before joining the faculty at Wright State in 2015.
https://www.fairborndailyherald.com/wp-content/uploads/sites/50/2018/10/web1_Kuppuswamy-Arumugam-20541_075-1-508×317.jpgSubmitted photo Kuppuswamy Arumugam, an assistant professor of chemistry at Wright State, leads a research project aimed at developing more effective cancer therapeutics.